NDT Consultancy & Training Centre (NDT CTC) is an independent organization specialized in providing professional training with a group of highly skilled, experienced and qualified professionals. The Managing Partner of the Organization, Mr. P. Chandra Sekhara Rao BE in Metallurgy & M.Tech in Mechanical is in this industry since more than 15 years and involved as leading inspection authority in many petrochemical plants, steel plants, power projects, manufacturing industries etc and qualified ASNT Level III in RT, UT, MT, PT Welding Inspector - CSWIP 3.1, API 570 Piping Inspector. The General Manager of the Organization, Ms. R.L.S Lakshmi Graduate and retired in Civil Supplies is with us since 5 years having an exceptional leadership and interpersonal abilities and involved in directing operations, employees, sales and customer service strategies to drive business development and enhance overall performance. The Business development Manager of the Organization, Mr.Aditya with engineering graduate having a strong history of driving dynamic product sales, managing client relationships and substantially increasing revenues and stand to significantly contribute to his position. His excellency in identifying new business opportunities, cultivating and maintaining relatipships with executive business partners, and spearheading effective sales and market penetration strategies positions him to a senior-level professional in the organization. The Operational Manager of the Organization, Mr.Bhaskar Qualified ASNT Level II in RT,UT,MT,PT, Cswip 3.1 Welding Inspector and API 570 Piping Inspector is in this industry since more than 15 years and involved as leading inspection authority in many petrochemical plants, steel plants, power projects and manufacturing industries. His wide experience in technical and management field and having an excellent expertise in Planning and controlling changes, Researching new technologies and alternative methods of efficiency, setting and reviewng budgets and managing cost, overseeing inventory, distribution of goods and facility layout is the result of his senior position in the organization. In addition he is a share holder of this organization. The Branch Head of Mooradabad Branch, Mr.Sarfaraz who has worked along with Mr. Jagadish in Kuwait and having a wide experience in technical field. He was assigned as lead position in many national and international Organizations. He is having 15 years of experience which include but not limited to hading the entire team of operations and management, customer service, human resources, administration and sale, Assess local market conditions and identify current and prospective sales opportunities, developing and forecasting the finacial objectives and business plan, bring out the best of branch's personnel by provding training, coaching, development and motivation. The Branch Head of Hyderabad Branch, Ms.Sowjanya with post graduation in finance and accounting having a wide experience in administrative and HR field for around 10 years. She was assigned as lead position in many national Organizations and involved in key activities like formulating the organization's future direction and supporting tactical initiatives, monitor and direct the implementation of strategic business plan, develop financial and tax strategies, Manage the capital request and budgeting processes. Non Destructive Testing Services like Ultrasonic Testing, Ultrasonic Thickness gauging, Magnetic Particle Testing, Dye Penetrant Testing etc. Providing Professionally qualified professionals like ASNT NDT level 2 & level 3 personnel, CSWIP 3.1 welding inspectors, NACE/BGAS painting inspectors, specially trained personnel as per the client requirement within India & Overseas. Providing Training for NDT level – I, II & III, CSWIP 3.1 welding inspectors, BGAS painting inspectors. 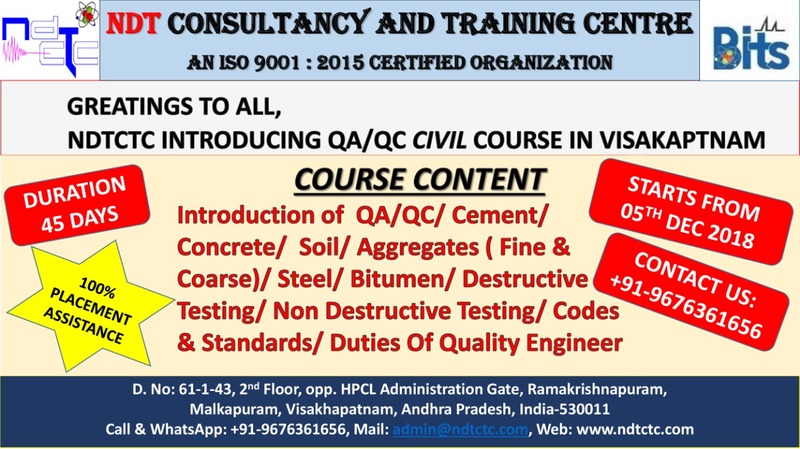 Providing QA/QC & NDT level 3 Consultancy services. ASME Code related services like training of staff, review and approval of procedures to the latest revision of codes, NDT Procedure Qualification etc. Provide Calibration of NDT Equipment.